With the final culling to determine the top 10 boats in both the Men and Women’s Gold fleet going through to tomorrow’s concluding medal race, today was the most traumatic to date at the 470 Worlds, organised by the Royal Danish Yacht Club and held off Rungsted to the north of Copenhagen, Denmark. In both fleets some impressive snakes and ladders took place despite the late stage of this regatta. The wind today was similar to yesterday with a reasonably stable moderate southerly breeze that died off half way through the second race. But the summery conditions had given way to a more autumnal hue, more chilly and with the sky overcast. 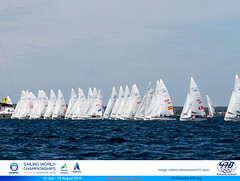 Common to both the Men’s and Women’s fleets is that the Gold medal position tomorrow is looking reasonably secure. In the Women, it is of course the unshakable, consistent Dutch duo of Lisa Westerhof and Lobke Berkhout, who today posted a 6-1, and still hold an eighth as a discard. 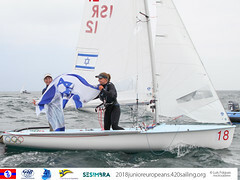 After today’s racing they are now 14 points ahead of the Junior World Championship winners from Spain, Tara Pacheco and Berta Betanzos, on 48 points and third placed Ingrid Petitjean and Nadège Douroux from France on 54. The top performance of the day was that of the young Spanish crew Pacheco and Betanzos, who after scoring two seconds, climbed up from fourth to second this morning, swapping places with Italy’s Guilia Conti and Giovanna Micol by the end of the day. Equally pleased with her performance and that of her crew Isabelle Kinsolving Farrar was US Sailing Team Alphagrapics’ Erin Maxwell, the reigning World Champion, who scraped into tomorrow’s medal race by just one point ahead of Argentinians Maria Fernando Sesto and Consuelo Monsegur. Like so many here who represented their respective countries in Beijing last year, Maxwell and her crew have taken a break from sailing over these last months. In terms of race course specifics, with the wind from the south, the right side of the course was paying as there seemed to be not only more relief from the current there but also better pressure. The Americans played this best and were able to win today’s first race, following this up with a ninth. As to getting into the medal race, Maxwell commented: “At the start of today I knew it was a possibility but I gave ourselves a 40% chance of making the medal race. I knew we were sailing better and we were starting to feel more confident and feel a little greased. I knew it would be an uphill battle – the points were stacked against us, we were 13 points out of 10th at the start of the day and teams in front of us are all good teams. We knew that given the forecast they were all good teams in that wind velocity and unless we sailed our absolute best we weren’t going to make it.” But make they did and they have slid through to tomorrow’s medal race. But the biggest high jumpers today were once again the Greeks, Panagiotis Mantis and Kagialis Paulos, who in the high scoring men’s fleet posted a 2-9 today, causing them to soar from 17th to 10th place, and a place on tomorrow’s elite starting grid. Just 48 hours ago they were 30th. The Argentinians Luca Calabrese and Jean de la Fuente also squeezed into tomorrow’s medal race, having started the day in 12th and ending it four points ahead of the Greeks, at the expense of New Zealand’s Paul Snow-Hansen and Jason Saunders who plummeted eight places today. 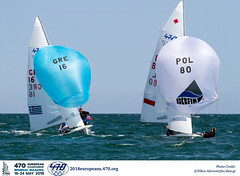 Another successful day on the water, while all the top men’s team suffered with the exception of the young French crew of Pierre LeBoucher and Vincent Garos and yesterday’s British stars Luke Patience and Stuart Bithell, has seen Croatia’s Šime Fantela and Igor Marenić gain a near unassailable 16 point lead among the Men. As to whether they expected they would be in this position, the World Championship all but in the bag for them, Marenić admitted that after their European Championship win they knew they were on top form but they didn’t expect to be leading the Worlds. “After our fourth in the first race we knew we still had a good discard and we thought we could risk more so we risked a bit on the start. We must have been very close to OCS and it paid off.” They, like the Women’s leaders, won the second race today. While the Croats’ lead is looking comfortable, the fight for the remaining podium spots is anything but, with two points separating the second to fourth placed boats going into the Medal race.